Police said they arrested seven individuals who were plotting a terrorist attack on a major event in the Netherlands. Dutch authorities said the seven suspects allegedly tried to obtain AK-47s, hand grenades and materials to make bombs, UPI reported on Sept. 27. “The plan may have involved jackets packed with explosives and Kalashnikovs at an event and a car bomb elsewhere. The investigation into the exact target is still ongoing,” the Dutch prosecutor’s office said. The prosecutor’s office said it was tipped off to the terror plot by intelligence officials in April. The officials said the suspects allegedly planned to attack a large event that would yield many victims. 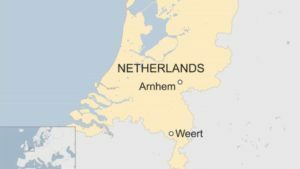 The suspects were arrested on Sept. 27 in Arnhem and in Weert, a region close to the Belgian border. At least three of the suspects were previously convicted of attempting to join the Islamic State (ISIS) in Syria. In June this year, Europol said the risk of attacks by ISIS remained acute in Europe. Earlier this month, an Islamic terrorist was shot by Dutch police after stabbing two American tourists in Amsterdam.